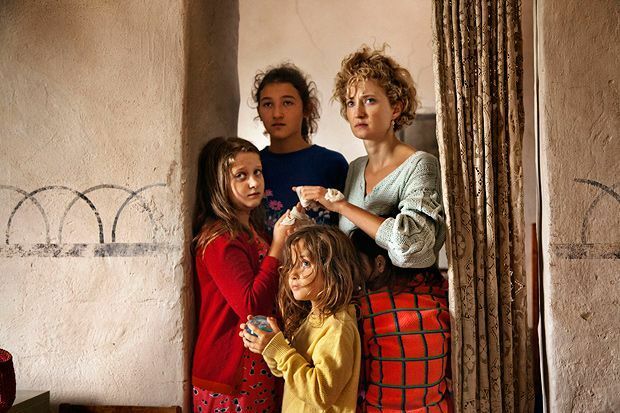 A chaotic brood are disconcerting and ultimately heartrending in this Cannes Grand Prix winner from Italian director Alice Rohrwacher (Corpo Celeste) that deftly marries naturalism and idiosyncrasy. Her second narrative feature is a vital portrait of a life lived outside the strictures of society, which finds a family residing in rural Italy slave to the mad whims of patriarch and enthusiastic apiarist Wolfgang (Sam Louwyck). 'When he's not here we can breathe,' observes his infuriated wife Angelica (Alba Rohrwacher, Alice's sister). Events are experienced through the eyes of 12-year-old Gelsomina (terrific newcomer Maria Alexandra Lungu), a rather severe and industrious pre-teen who's jokingly dubbed the 'head of the family' but whose inability to savour the simple joys of childhood is certainly no laughing matter. She's been put to work by her father in the clan's beekeeping business and also contributes to the care of her three unruly little sisters. The clouds of daily drudgery part with the arrival of a 14-year-old German delinquent, Martin (Luis Huilca), who Gelsomina takes a shine to, and when she meets glamorous TV presenter Milly Catena (Monica Bellucci) and enters their honey into the 'Countryside Wonders' competition against her father's wishes. Rohrwacher showed great confidence with child performers in her debut, another coming-of-age story, which centred on the preparations for a young girl's confirmation, and her work here is even more impressive. Her approach is sensitive and non-judgemental, carefully documenting the various dynamics that exist within the unit, and both the charm and folly of the family's eccentric lifestyle, with episodes that veer from the surreal to the sinister. Most of all, it's a film that knows the value of its appealing young stars and that makes their credible and entertaining antics its focus, winning you over with the squeals and strops of these tiny worker bees. Coming of age drama about the eldest daughter of former student revolutionaries making a living beekeeping in the Tuscan countryside. As she approaches adolescence Gelsomina grows to realise this is not the life she wants.